All Albums in One Place!! 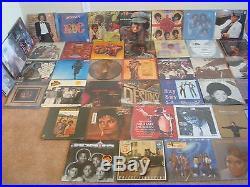 The Ultimate Michael Jackson & Jackson 5 Vinyl Record Collection! Why is this 82-piece collection so rare? 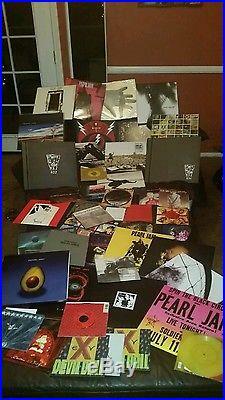 All albums (33 RPM, Vinyl, 12 inch LPs) are Factory Sealed, Never Opened, and Never Played! 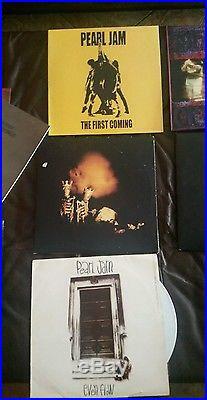 Correction: all except four (4) Records are Factory Sealed – and those 4 have Never Been Played, Never Opened, and are in its Original Wrap, they just didn’t come factory sealed. All remaining 78 records are in Pristine, Mint, and Excellent Condition – I really hate to let them go, they’re just Simply Beautiful! This is my personal collection and to be honest, I enjoy looking at the Magnificent Photos on the front and back of the Albums. I’ve had them for some time now, and I figure it’s time to share with the world and pass this Work of Beauty on to the next Lucky person. All are Originals, No Re-issues! 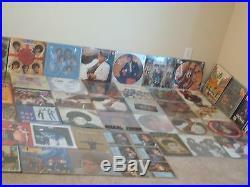 All Jackson 5 Studio Albums (Sealed). ABC, 1970 Motown – New in original shrink wrap, Gorgeous Blue Color! 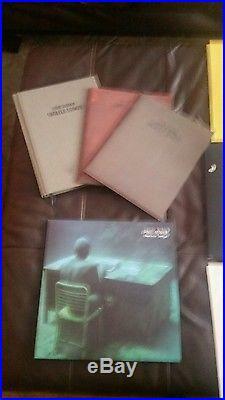 Third Album – New in original shrink wrap, Perfect condition! The Jackson 5 Christmas Album, Motown – New in original shrink wrap, This is a Keeper! Maybe Tomorrow, 1971 Motown – New in original shrink wrap, Perfect condition! Lookin’ Through the Windows, 1972 Motown – New in original shrink wrap, Perfect condition! Skywriter 1973 – New in original shrink wrap, Perfect condition! Get It Together, 1973 – New in original shrink wrap, The Red & Orange Colors are Dazzling! Dancing Machine, 1974 Motown – New in original shrink wrap, small cut out bottom right corner. Moving Violation, 1975 Motown – New in original shrink wrap, small cut out top left corner. Joyful Jukebox Music, 1976 Motown – New in original shrink wrap, small cut out bottom left. The Jacksons, 1976 CBS – New in original shrink wrap, Sticker, small tear in wrap at bottom. Goin’ Places, 1977 CBS – New in original shrink wrap, Mint condition! 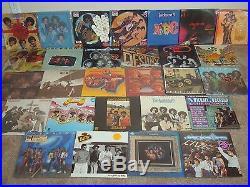 Anthology, 1976 Motown – You can’t find this one everywhere!! New in original shrink wrap, slight tear in shrink wrap on all 4 corners. Destiny, 1978 – New in original shrink wrap, Perfect condition! Boogie, 1979 Motown – Good Luck trying to find this one!! New in original shrink wrap, Perfect condition! Triumph, 1980 Epic – with Sticker, New in original shrink wrap, Perfect condition! Going Back to Indiana, 1971 CBS – New in original shrink wrap, slight tear in wrap on corners. Victory, 1984 CBS – with Sticker, New in original shrink wrap, slight tear on corners. 2300 Jackson Street, 1989 CBS – with Sticker, New in original shrink wrap. 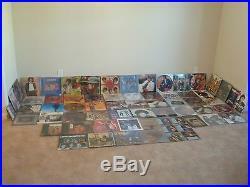 Jackson 5, 2 LPs, Pickwick – Introduction by Bill Cosby, New in original shrink wrap, Perfect condition! 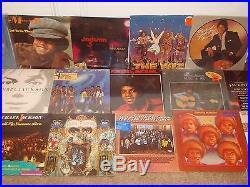 Jackson 5 Stand, Pickwick – New in original shrink wrap, cut out top right. Michael Jackson & Jackson 5. Great Songs & Performances that inspired Motown 25th Anniversary TV Special, 1983 Motown – New in original shrink wrap, Perfect condition! Jackson 5 Greatest Hits, 1971 Motown – New in original shrink wrap, Perfect condition! The Jacksons Live, 1981 CBS – New in original shrink wrap, with Sticker, Perfect condition! All Michael Jackson Studio Albums (Sealed):Got to Be There, 1971 Motown – New in original shrink wrap, I love the pic of young Michael on the back! Ben, 1972 Motown – New in original shrink wrap, small tear in wrap bottom rightMusic & Me, 1973 Motown – New in original shrink wrap, Perfect condition! 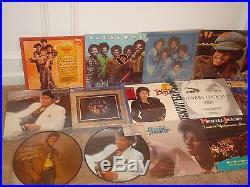 Forever Michael, 1975 Motown – New in original shrink wrap, small tear right corner! Thriller, 1982 CBS – New in original shrink wrap, Mint condition! Dangerous, 1991 Epic – 2 Records, New in original shrink wrap, small tear bottom rightHistory, 1995 Epic – 3 Records, New in original shrink wrap, Perfect condition! Invincible, 2001 Epic – 2 Records, New in original shrink wrap, Mint condition! Michael Jackson Compilations (Sealed):The Best of Michael Jackson, 1975 Motown – New in original shrink wrap, Perfect condition! One Day in Your Life, 1981 Motown – New in original shrink wrap, Mint! 18 Greatest Hits, 1983 Motown – New in original shrink wrap, Perfect condition! 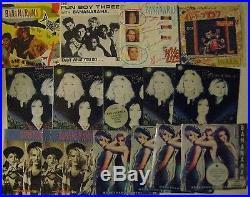 9 Singles Pack, Set, CBS, London – New in original shrink wrap, Sealed, Pressed on Colored Vinyl, (7 inch Singles, 45 RPM) – Never Opened! I really want to open this one! Farewell My Summer Love, 1984 Motown – New in original shrink wrap, Perfect condition with Bonus Color Poster! The Great Love Songs of Michael Jackson, 1984 Motown – New in original shrink wrap, Perfect condition! Michael Jackson Souvenir Singles Pack, 1988 CBS – A Beautiful Rarity six, 7-inch Singles, 45 RPM, This one is not sealed, it didn’t come sealed, is in Original Plastic Covering and Never Played! This one is Magnificent to witness!!! Blood On The Dance Floor, 1997 Epic – New in original shrink wrap, Perfect condition! Michael Jackson The Motown Years, His Greatest Hits, 1988 Motown – New in original shrink wrap, Perfect condition! The Acapella Album (Red) – this one is not sealed, but has Never Been opened, Never Played, Limited Edition 1 of only 250 copies! Michael Jackson Singles (all are 12 inch, LPs, Sealed):Smooth Criminal, 1988 Epic – New in original shrink wrap, Perfect condition! Remember the Time, 1991 Epic – with Stickers, New in original shrink wrap, Mint – Beautiful! Beat It, 1983 CBS London – New in original shrink wrap, Perfect condition! Blood on the Dance Floor, 1997 Epic – New in original shrink wrap, Perfect condition! I Just Can’t Stop Loving You, Spanish & English Version, 1988 CBS – New in original shrink wrap, Perfect condition! 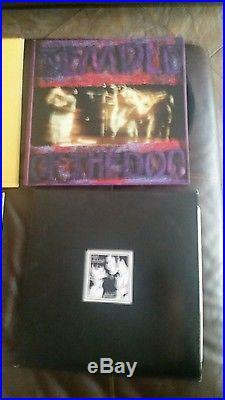 In The Closet, 3 Mixes behind Door # 1, 1991 Epic – New in original shrink wrap, Perfect condition! In The Closet, 3 Mixes behind Door # 2, 1991 Epic – New in original shrink wrap, Perfect condition! Black or White, 1991 Epic – New in original shrink wrap, Perfect condition! Dirty Diana, 1988 CBS – Includes Tour Poster, New in original shrink wrap, Perfect condition! Scream, 1995 Epic – New in original shrink wrap, Mint condition! The Essential Michael Jackson, 2005 Motown – New in original shrink wrap, Perfect condition! Brilliant Color Picture Discs (Sealed):Jackson 5, 14 Greatest Hits Picture Disc, Collectors Edition, 1984 Motown – New in original shrink wrap, Perfect condition! Jackson 5, 14 Greatest Hits Picture Disc with Glove, 1984 Motown – New in original shrink wrap, I want to wear that glove! Jackson 5 Awesome Blue Picture Disc – RARE – The color is Fantastic! This is one not sealed, but is in Original Shrink Wrap and Never Played! Thriller Picture Disc, Purple Hue – with Sticker, New in original shrink wrap, small tear in bottom wrap! The Story of Michael Jackson told by Jerry Cowan Picture Disc, with Red Thriller Jacket on – New in original shrink wrap, small tear in bottom and topThriller Picture Disc, sitting down, Hot! – Import, New in original shrink wrap, Mint condition! Michael Jackson Thriller with Red Band – This one is not sealed, but is in the Original Wrap, has Never Been Opened, and Never Played! 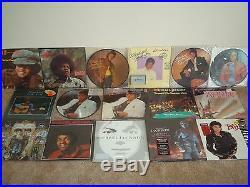 Jackson 5, Victory Picture Disc – with Stickers, Sealed! Others (Factory Sealed):Michael Jackson Thriller Special Maxi Cassette, Thriller Long Version and Special Edit Cassette Version, 1983 CBS – New in original shrink wrap, small tears in wrapThe Jackson 5 Superstar Series, 1980 Motown – New in original shrink wrap, Perfect condition! Michael Jackson Superstar Series, 1980 Motown – New in original shrink wrap, Mint! The Original Soul of Michael Jackson, 1987 Motown – New in original shrink wrap, Perfect condition! Narrated by Michael Jackson Storybook Album, Includes Color Poster, Color Storybook, 1982 MCA – New in original shrink wrap, Perfect condition! We Are The World, 1985 Warner Bros – with Sticker, New in original shrink wrap, Perfect condition! 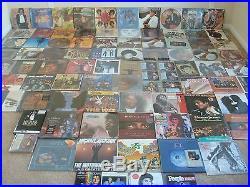 Thriller, 25th Edition, 2008 Epic 2 LPS – New in original shrink wrap, Awesome! Michael Jackson, The Remix Suite, 2009 Universal Motown Records – New in original shrink wrap, Perfect condition! 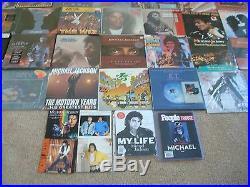 Nine (9) BONUS Items (Mint):Michael Jackson’s THIS IS IT, 2009 Sony – 4 LP Box Set, New in original shrink wrap, Mint! Michael Jackson Puzzle, over 500 pieces, 1984, “Michael and Friends” – New in original shrink wrap, Never Opened! Michael Jackson Puzzle, over 500 pieces, 1984, “A Shining Star” – New in original shrink wrap, Never Opened! USA Today Special Edition Newspaper Commemorating Michael’s Life and Music – Sealed, Never Opened! Michael Jackson Mixed Masters, 1987 CBS – New in original shrink wrap, Perfect! Michael Jackson with Paul McCartney, 1982 CBS “The Girl Is Mine” 7-inch Import Single – not sealed, Never Played, Mint! Leave Me Alone, 1989 CBS, 7-inch Import Single – not sealed, Never Played, Mint! Smooth Criminal, 1988 CBS, 7-inch Import Single – not sealed, Never Played, Brilliant Color! Liberian Girl, 1989 Epic, 7-inch Import Single – not sealed, Never Played, Mint! We Love You Michael! The item “The Ultimate Michael Jackson Album Collection” is in sale since Sunday, January 1, 2017. This item is in the category “Music\Records”. The seller is “afrespect” and is located in Madison, Alabama. This item can be shipped to United States. 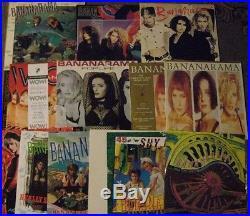 Awesome lot of 102 Bananarama records nearly every single release in there catalog with a ton of imports! 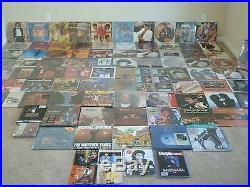 Many 12 singles, 45’s and LP’s. Overall condition of the lot is in awesome shape! One of the records is autographed by 2 of the members! Also included as a bonus is rare japanese tour flyer from 1989! 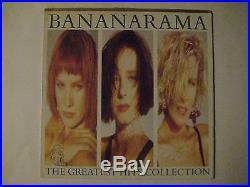 This is a great opportunity to instantly gain the ultimate Bananarama collection! Check out complete list below! 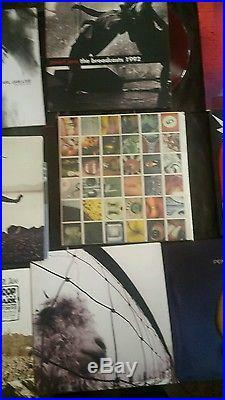 Long Train Running- 10 Single 1991 London UK pressing NANPD 24; Has insert sheet! Custom sleeve is a strong VG+; Vinyl is a strong VG+; Has a slight warp but does not affect play; Housed in a PVC sleeve which has a thin clear tape repair on bottom. I Want You Back- 10 single 1988 London UK press NANG 16. Vinyl and gatefold cover are both a strong VG+. Long Train Running- 1991 London UK press LC 7654; Cover is a strong VG+; Vinyl is VG+/NM! Cruel Summer- 1984 London US press 810 291-1; Vinyl is NM! Company sleeve is VG+. Robert De Niro’s Waiting… 1984 Metronome German press 820 033-1ME; Cover is VG+; Vinyl is VG+/NM! 1984 London UK press on Pink colored vinyl. 820033-1; Vinyl is a strong VG+; Generic clear sleeve. Nathan Jones- 1988 London US Promo 886 481-1; Cover is NM! Has gold promo stamp on back; Vinyl is NM! Nathan Jones- 1988 London US press 886 481-1; Vinyl is NM! Nathan Jones- 1988 London UK pressing NANX 18; Cover is NM! Nathan Jones (Remix)- 1988 London UK press NANXR 18; Vinyl is VG+/NM! I Can’t Help It /Remix- 1987 London UK press NANXR 15; Cover is VG+; Vinyl is a strong VG+. Mega-mix- 1988 London Spain press 886 245-1; Vinyl is VG+; Cover is VG+. Megarama 89′- 1989 Metronome German press 886731-1; Vinyl & cover are both NM! I Want You Back- 1988 London UK press NANX 16; Vinyl is VG+/NM! Cover is a strong VG+. Rough Justice- 1984 London UK press NANX 7; Cover is VG+; Vinyl is a strong VG+. Venus- 1986 London US press 886 056-1; Vinyl is NM! Venus- Fire & Brimstone Mix The Hellfire Mix- 1986 London US press 886 088-1; Vinyl is NM! A Trick Of The Night- 1986 London US press 886 119-1; Cover is NM! Vinyl is a strong VG+. A Trick Of The Night- 1987 London UK press NANX 12; Vinyl is a strong VG+; Cover is VG+ has hype sticker. Only Your Love- 1990 London UK press NANX 21; Cover is VG+; Vinyl is VG+. Cruel Summer’89- 1989 London UK press NANX 19; Vinyl is NM! I Can’t Help It / Extended Version- 1987 London UK press NANX 15; Cover is a strong VG+; Vinyl is VG+. Love In The First Degree- 1987 London US press 886-262-1; Vinyl is NM! 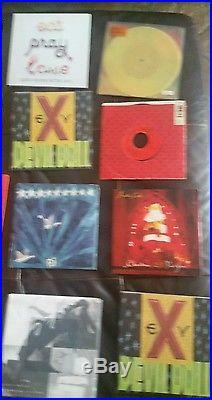 I Heard A Rumour- 1987 London UK press NANX 13; Vinyl is a strong VG+; Cover is VG+. Only Your Love Remix- 1990 London UK press NANXR 21; Cover is a strong VG+; Vinyl is NM! Tripping On Your Love- 1991 London US Promo 869 547-1; Vinyl is NM! Cover is VG+; Has gold promo stamp on back. Tripping On Your Love- 1991 London UK press NANX 22; Vinyl is NM! 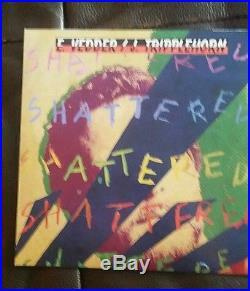 Preacher Man Remix- 1991 London UK press NANXR 23; Vinyl is a strong VG+; Cover is a strong VG+. Preacher Man Remix- 1991 London UK press NANX 23; Vinyl is VG+; Cover is a strong VG+. Love, Truth & Honesty- 1988 London UK press NANX 17; Vinyl is VG+; Cover is NM! Love, Truth & Honesty- 1988 London US press 886 395-1; Vinyl is NM! Love, Truth & Honesty The Remixes- 1988 London UK press NANXR 17; Cover is VG+; Vinyl is a strong VG+. 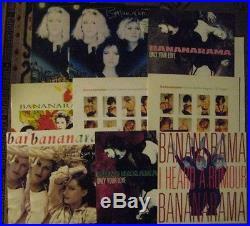 Bananarama- 1983 London Japan Press L15P1153; Vinyl is VG+; Cover is VG+ has hype sticker. Love In The First Degree- 1987 London UK press NANXR 14; Cover is a strong VG+; Vinyl is a strong VG+. I Can’t Help It- 1987 London US press 886 212-1; Cover is a strong VG+; Vinyl is NM! 1989 London Brazilian pressing 2801 336; Cover is VG; Vinyl is NM! 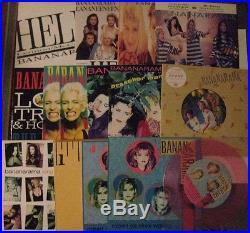 Bananarama/ Lananeeneenoonoo- Help- 1989 London UK press LONX 222; Vinyl is VG; Cover is VG+. More Than Physical- 1986 London US press 886 080-1; Cover is a strong VG+; Vinyl is NM! More Than Physical- 1986 London UK press NANX 11; Cover is VG+; Vinyl is NM! Bananarama & Fun Boy Three- Really Saying Something- 1982 Deram UK press NANX 1; Cover is VG+ has some small seam splitting; Vinyl is a strong VG+. NA NA Hey Hey Kiss Him Goodbye- 1983 London UK press NANX 4; Cover is VG has some seam splitting; Vinyl is VG. Shy Boy- 1982 London UK press NANX 2; Vinyl is VG+; Cover is VG+. More Than Physical (Muscle Mix)- 1986 London US Promo PRO 4601; Vinyl is a strong VG+; Generic cover. The Greatest HIts Collection (Edicion Especial)- 2xLP 1988 London Spain press 828 143-1; Cover is VG+; Both records are a strong VG+; Has both custom inner sleeves. The Greatest Hits Collection- 1988 London UK press RAMA 5; Autographed by 2 of the girls on front! Cover is VG has a 2 seam split on top; Has contest winner letter from style magazine; Vinyl is a strong VG+; Has custom inner sleeve. Pop Life- 1991 London EU press 828246.1; Cover and vinyl are both NM! Has hype sticker and custom inner sleeve. 1987 London US press 444-828 061-1 R-1; Has promotional flyer sheet, and 2 press inserts (a 3 pg Bio & glossy 8×10 b&w photo); Vinyl is NM! Cover is a strong VG+; Has custom inner sleeve. 1988 London UK press RAMA G4; Gatefold cover is NM! 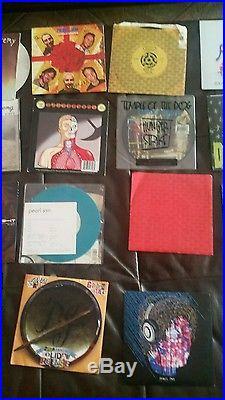 Has hype sticker & OBI strip; LP disc is VG+; Bonus EP disc is NM! Has custom inner sleeve. True Confessions- 1986 London US press 828 013-1 R-1; Has 3 pg Bio, a 8×10 b&w photo and a postcard; Cover is NM! Vinyl is a strong VG+; Has custom inner sleeve. 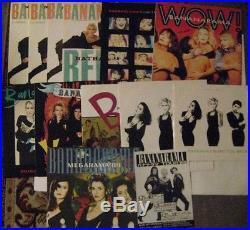 Bananarama- 1984 London US press 820 165-1 R-1; Has 2 postcard inserts! Deep Sea Skiving- 1983 London US press 810 102-1 R-1; Has 3 pg Bio and 8×10 b&w photo; Vinyl and cover are both a strong VG+; Has custom inner sleeve. The Wild Life/ The State I’m In- 1984 London US; Vinyl is a strong VG+; Picture sleeve is NM! T’aint What You Do/ The Funrama Theme- 1982 Chrysalis Spain press; Vinyl is NM! Picture sleeve is VG+. Aie A Mwana/ Dubwana- 1981 Deram UK press; Vinyl & picture sleeve are both VG+; Record has a slight warp but does not affect play. Do Not Disturb/ Ghost- 1985 London UK press; Picture sleeve is VG/VG+; Vinyl is VG. Do Not Disturb/ Ghost- 1985 London German press; Vinyl is VG+; Picture sleeve is VG+. I Can’t Help It/ Mr. Sleaze- 1987 London US press; Vinyl is NM! 1989 FFRR Records US press; Vinyl is NM! Picture sleeve is a strong VG+. Love In The First Degree/. Ecstasy- 1987 London US press; Vinyl is NM! Picture sleeve is NM! I Heard A Rumour/ Clean Cut Boy (Party Size)- 1987 London US press; Vinyl is VG+/NM! Rough Justice/Live Now- 1984 London UK press; Lenticular sleeve is VG+ is slightly curved along top; Vinyl is a strong VG+. Rough Justice/ Live Now – 1984 London UK press; Picture sleeve is VG; Vinyl is VG+. Na Na Hey Hey Kiss Him Goodbye/ Tell Tale Signs- 1982 London UK press; Picture sleeve is VG+; Vinyl is VG+. Na Na Hey Hey Kiss Him Goodbye/ Tell Tale Signs- 1983 London US press; Vinyl is VG+; Picture sleeve is VG+. Na Na Hey Hey Kiss Him Goodbye/ Tell Tale Signs- 1983 London Spain press; Picture sleeve is VG/VG+; Vinyl is VG+. He Was Really Sayin’ Somethin’- 1982 London Promo US press; Vinyl is G+ has an indentation that slightly affects play but does not cause any skips; Generic sleeve. He Was Really Sayin’ Somethin’/Give Us Back Our Cheap Fares- 1982 London US press; Vinyl is VG+ has a slight warp but does not affect play; Generic sleeve. Really Saying Something/ Give Us Back Our Cheap Fares- 1982 Deram UK press; Picture sleeve is VG+; Vinyl is VG+. Really Saying Something/ Give Us Back Our Cheap Fares- 1982 Deram Belgium press. Picture sleeve is VG+; Vinyl is VG/VG+. Really Saying Something/ Give Us Back Our Cheap Fares- 1982 Deram UK press; Poster sleeve is VG+; Vinyl is a strong VG+. Really Saying Something/ Cruel Summer- STILL SEALED! US double pack; both sleeves have some heavy creases. Cruel Summer/ Summer Dub- 1983 London UK Press; Vinyl is VG; Picture sleeve is VG. Cruel Summer/ Cruel Dub- 1984 London US press; Vinyl is VG+; Generic sleeve. (Don’t It Make You Feel Good)- 1983 London US Promo; Same song on both sides; Vinyl is a strong VG+; Generic sleeve. Shy Boy (Don’t It Make You Feel Good)/ Give Us Back Our Cheap Fares- 1983 London US press; Picture sleeve is VG+; Vinyl is a strong VG+. 1982 London UK press; Vinyl is a strong VG+; Picture sleeve is VG+. 1982 London UK Picture Disc; Vinyl is NM! Cheers Then/ Girl About Town- 1982 London UK press; Picture sleeve is VG+; Vinyl is VG+. Venus/ White Train- 1986 London UK press Picture Disc; Vinyl is VG+; PVC sleeve. Venus/ White Train- 1986 London US press; Picture sleeve is NM! Venus/ White Train- 1986 London Japan press Promo; Vinyl is a strong VG+; NM insert! Venus/ White Train- 1986 London UK press; Has poster! Vinyl is VG+; Picture sleeve is VG+. Long Train Running/ Outta Sight- 1991 London Spain Promo press; Picture sleeve is NM! Trick Of the Night/ Tricky Mix- 1987 London UK press Picture Disc; Vinyl is a strong VG+; PVC sleeve. Love, Truth & Honesty/ Strike It Rich- 1988 London US press; Vinyl is NM! 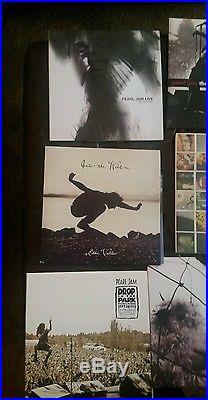 Picture sleeve is VG+/NM! 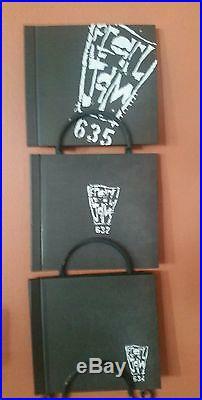 Love, Truth & Honesty/ Strike It Rich- 1988 FFRR UK box set with poster & 4 post cards! Vinyl is VG+; Box is a strong VG+. Robert De Niro’s Waiting/ Push! 1984 Decca US press; Picture sleeve is a strong VG+; Vinyl is NM! 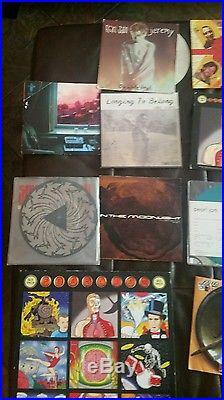 1984 London UK press; Picture sleeve is a strong VG+; Vinyl is a strong VG+. 1984 London Spain press; Picture sleeve is VG+/NM! A Trick Of The Night/ Cut Above The Rest- 1986 London US press; Vinyl is NM! A Trick Of The Night/ Cut Above The Rest- 1986 Liberation Australian press; Vinyl is VG+/NM! A Trick Of The Night/ Cut Above The Rest/ Trick Of The Night/ Set On You- 1987 London UK press 2x vinyl. Both records are VG/VG+ have a slight warp but do not affect play; Gatefold picture sleeve is VG+. A Trick Of The Night/ Cut Above The Rest/ Trick Of The Night/ Set On You- 1987 London UK press. STILL SEALED GATEFOLD SLEEVE! A Trick Of The Night/ Cut Above The Rest/ Trick Of The Night/ Set On You- 1987 London UK press; Non gatefold, single disc EP; Vinyl & picture sleeve are both VG+. More Than Physical/ Scarlett- 1986 London US press; Vinyl & pic sleeve are both a strong VG+. More Than Physical/ Scarlett/ Venus- 1986 London UK press; Poster sleeve 2x record pack; STILL SEALED! More Than Physical/ Scarlett- 1986 London UK press; STILL SEALED! More Than Physical/ Scarlett- 1986 London. UK press; Vinyl is VG+; Picture sleeve is VG+ has a small seam split. Hotline To Heaven/ State I’m In- 1984 London UK press; Vinyl is VG+ has a slight warp but does not affect play; Picture sleeve is VG has a couple of seam splits. Hotline To Heaven/ State I’m In- 1984 London UK press Puzzle sleeve; STILL SEALED! He’s Got Track/ Give Us Back Our Cheap Fares- 1982 London Japan press; Vinyl is NM! (If you are only ordering 1 record, and it is a double LP, it only counts as 1, but if you are ordering multiple records, double LP’s count as 2). Every record we send out is well packed with the record outside of the cover, in the inner sleeve, and both the cover and record next to each other inside of a protective plastic outer sleeve, sandwiched between cardboard stiffeners. We also use custom-cut, strong 14×14 boxes rather than smaller and flimsier standard record mailers, so that you receive your records in the same conditions as described, and without damage from transit! I grade all of my records conservatively, and according to the Goldmine grading guide. MINT: Only used for sealed LPs. NM: A nearly perfect record. No obvious signs of wear to vinyl or cover. I very rarely give this grade for a record. VG+: Vinyl will have light scuffs or marks that don’t hinder playback. Cover may show some light wear small seam split, minor stain, minor ring-wear, etc. Some people use the term EX, for me it is the same as VG+. VG: Vinyl will have visible, often mild surface wear that may result in some light surface noise. Cover will have noticeable wear ring-wear, light tape, minor tears, splits, etc. G+: Vinyl will have moderate to heavy scuffing that should cause no skips, but a fair amount of surface noise. Cover will have extensive wear heavy tape, tears, etc. G: Vinyl will have very heavy scuffing and some deep scratches. It might play with a skip or two. Cover will show major wear. POOR – Vinyl is borderline unplayable. Expect possible skips and jumps. Cover will have major defects. ALL LPs ARE VISUALLY GRADED UNLESS STATED OTHERWISE! PLEASE CONTACT ME WITH ANY QUESTIONS, AND I WILL HAPPILY ANSWER THEM AS QUICKLY AND BEST AS I CAN. 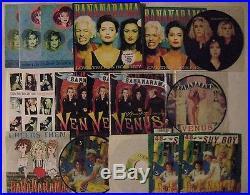 The item “Ultimate Bananarama Vinyl Lot! 102 records LP’s 45’s IMPORTS PIC DISCS AUTOGRAPH” is in sale since Thursday, January 12, 2017. This item is in the category “Music\Records”. 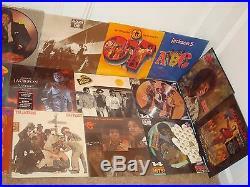 The seller is “ramarecords” and is located in Beacon, New York. This item can be shipped to United States. Excellent condition no bends. The item “The ultimate Pearl Jam vinyl collection” is in sale since Sunday, February 28, 2016. This item is in the category “Music\Records”. 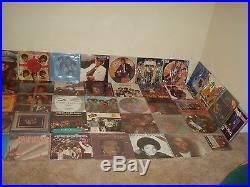 The seller is “worldwide1011″ and is located in Las Vegas, Nevada. This item can be shipped to United States.